Home Events PURPLE RUN – Udaipur’s Biggest Running Event at Forum Celebration Mall Udaipur! PURPLE RUN – Udaipur’s Biggest Running Event at Forum Celebration Mall Udaipur! Our City’s very own The Celebration Mall turned to FORUM Celebration Mall earlier this year. It is now a part of FORUM Malls, a Prestige Group Enterprise which owns and manages more than 7 shopping malls in 6 different cities of India. In the year 2017 Forum started “Purple Run” with an aim to create awareness about Alzheimer’s disease. With more than 10,000 runners across the country, the event was an instant success among health enthusiasts. 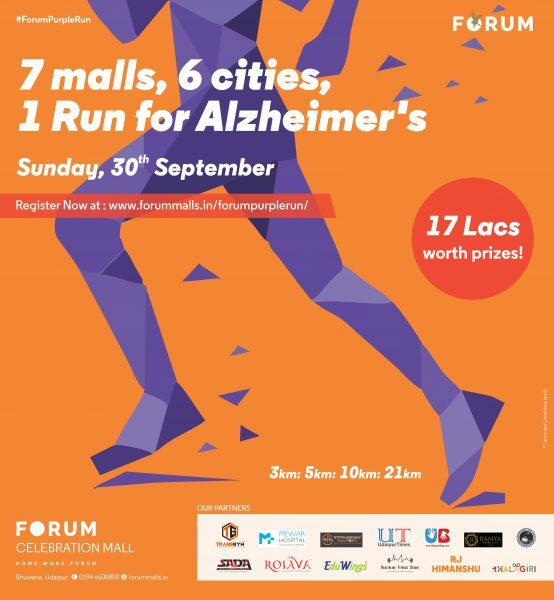 Now in 2018 with the advent of newer dimensions to the largest mall of Udaipur, FORUM Celebration Mall along with 6 other malls across the country are going to organize this year’s Purple Run on 30th September 2018. This is planned to be Udaipur’s Biggest Running event with more than 2000 runner across 4 different categories running to create awareness about Alzheimer’s. According to the Alzheimer’s Association, Alzheimer’s is a type of dementia that causes problems with memory, thinking, and behavior. In its early stages, memory loss is mild, but with late-stage Alzheimer’s, individuals lose the ability to carry on a conversation and respond to their environment. Symptoms usually develop slowly and get worse over time, becoming severe enough to interfere with daily tasks. The stats suggest, in India more than 4 million people suffer from some form of dementia and it’s the 5th leading cause of death in people over 55 years of age. We the people of Udaipur shop and have a gala time at the Forum Celebration Mall every time. Now, it’s our turn to make a mark in Udaipur’s history. It’s time to make it BIG by participating in Purple Run. Anyone and everyone can be part of Udaipur’s biggest running event. With 4 running categories, you can participate in either competitive or non-competitive races for 3km, 5km, 10km, and 21km. This year, the Purple Run will target more than 20,000 participants running across 7 malls in 6 cities for the same cause on the same day. The last date for entry for each category is 26th Sep 2018, Thursday, 9 pm or as soon as running places are filled, whichever is earlier. The last date to register for the event is Wednesday, 26th September 2018 before 9 PM. So, get ready to join hands for Udaipur’s Biggest Running event! Next articleउदयपुर के उस लड़के की कहानी जिसके सामने लन्दन, रूस और अमेरिका के डांसर्स भी पानी भरते थे.